What are the Voices of North Africa Saying? Algeria, Morocco, Western Sahara, Tunisia, Libya and Egypt, the North African border countries, have all seen recent developments. 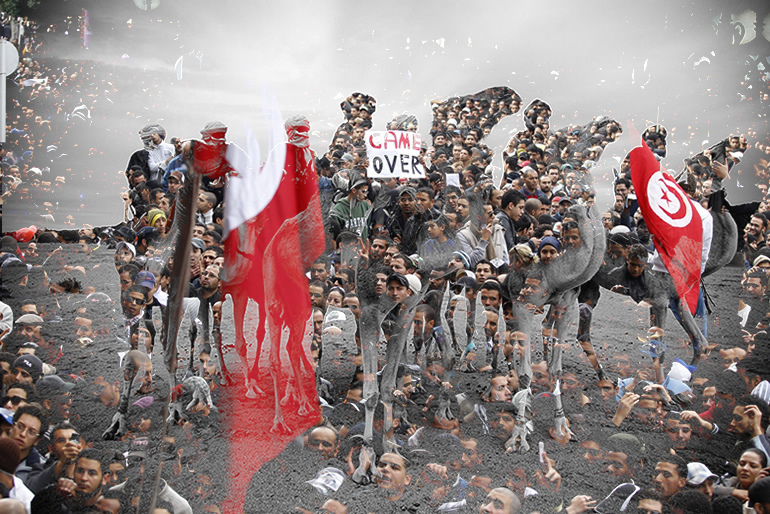 Western Sahara, Morocco and the Polisario Front lead the way into the demonstrations and violence in North Africa. Egypt recently saw an election which was questioned by opposition, dialogue and questions on democracy rose and sporadic protests continued. Now, Reuters reported that the young members of Egypt's Muslim Brotherhood said on Sunday they would join an anti-government protest this week triggered by the turmoil in Tunisia. Algeria streets took to protest and demonstrations, due to rises in food prices and general discontent. Tunisian nation wide demonstrations, change of Presidency, repression, new demands and separation of the opposition, today broke the news again, with tear gas. BBC reported, that protesters who �defied an overnight curfew� were met by Tunisian police forces that fired tear gas at protesters. They were said to be demanding the removal of all allies of former President Zine al-Abidine Ben Ali. News coming out from Africa is always complex. They range from new growing business to developing industries, new oii reserves, protests, crisis, piracy, business, massive events, and historical discoveries. North Africa is no stranger to violence and terrorism. Terrorist cells have been "targeting Africa for some time". The findings of Timbuktu manuscripts prove that the Arab presence in North Africa has been strong since ancient times. Africa was the first continent into which Islam expanded. Islam is a predominant religion in African countries. While the north African border countries are under political changes, further South business and tourism continue rising. China, is just one of the countries, which has showed an increasing interest in Africa. China�s developing economy in need of resources views Africa as a potential partner. Africa news reported on a study of the United Nations Economic Commission for Africa (UNECA) which reached the conclusion that �Africa's rapid growth in industrial technological acquisition� brings hope that the �continent�. Africa is part of the fast developing regions. Africa�s resource are now establishing industrial foundations. Is there an unity in the events of Africa that are breaking world news? The idea of a united Africa is not new. Pan-Africanism is concept which goes back deep into African centuries. Pan-Africanism calls for a politically and economically united Africa or unity of African people. COMESA, the Common Market for Eastern and Southern Africa is a free trade area with nineteen member states stretching from Libya to Zimbabwe. The SADC, Southern African Development Community aims to socio-economic cooperation, political and security cooperation�s as well as integration between 15 southern African states. And the Africa Free Trade Zone (AFTZ) is a free trade zone announced at the EAC-SADC-COMESA Summit. Africa continues to engage with the world. Economically African countries are united by agreements, from South to East, West and its Northern Borders. Africa as a continent is not only filled with rich natural resources it�s incredible culture spreads through the region. You can contact us via Poploid Twitter account. Copyright © Poploid.com 2012-2019 All Rights Reserved.